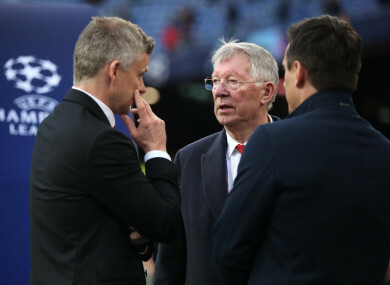 Manchester United manager Ole Gunnar Solskjaer, Sir Alex Ferguson, and Gary Neville talk before last night's match. WHEN THINGS ARE going badly in football, there is often a tendency for people to identify a scapegoat. For the last few years at Man United, that scapegoat was generally the manager, whether it be David Moyes, Louis van Gaal or Jose Mourinho. Up until recently, there was a clear inference that Man United’s disastrous start to the season was purely down to Jose Mourinho. When Ole Gunnar Solskjaer’s caretaker reign coincided with an upturn in fortune, it seemed to back up certain people’s views that the sole problem beforehand had been Mourinho and his moody personality combined with negative tactics. The Norwegian had “freed” the players to “go and express themselves” and got them playing “with smiles on their faces” again. There was an element of truth to these suggestions, of course. Yes, Mourinho had not been a perfect manager and had unwisely alienated himself from some senior players. And indeed, Solskjaer deserved credit for improving the results. But as with almost everything in football, particularly in this deeply reactionary social media age, the change was overhyped. Reports of ‘the old Manchester United’ having been revived were deeply exaggerated. The Norwegian was helped by good fortune, including a favourable early run of fixtures against weak teams in the bottom half of the league. Notable wins against Tottenham, where David de Gea was man of the match, and against PSG, where their opponents were undone by a mixture of wasteful finishing and complacency, also contained plenty of luck. After the ecstasy of Paris, more recent results have painted a truer reflection of where the club are at. There have been losses to Wolves (twice) and Arsenal, while wins against West Ham and Watford were less than convincing. The shift in mood is epitomised by the analysis of club legend, Gary Neville. After the PSG triumph, he effectively congratulated Solskjaer in an interview on securing the United permanent job before the news had been confirmed. After last night though, the former player suggested the entire United defence needed to be dispensed with, while he was also heavily critical of Paul Pogba among others. Yet the issues that were starkly apparent on Tuesday cannot be blamed on one individual. Their loss last night is not squarely the fault of Mourinho, Solsjkaer, Pogba or whoever you want to choose as scapegoat. Instead, the toothless performance was the culmination of an abundance of bad decisions from people that run the club. As @Unitedology pointed out on Twitter, four of the Red Devils’ back five last night were playing when they exited at the group stages in 2011 against Basel — Chris Smalling, Phil Jones, Ashley Young and David De Gea. With the exception of their world-class goalkeeper, in the eight years since, these individuals have rarely convinced as players good enough for the elite level that United aspire to compete at. Hundreds of millions have been utilised by the club since then. Players such as Marcos Rojo, Matteo Darmian, Angel Di Maria, Radamel Falcao, Eric Bailly, Luke Shaw, Nemanja Matic, Juan Mata, Romelu Lukaku, Alexis Sanchez and Victor Lindelof have come in. While it would harsh to label all of these players as failures, they generally been closer to misses than hits. Of course, every team gets transfers wrong on occasion — even the two current Premier League title contenders, Liverpool and Man City, have been far from perfect in that regard. But the degree to which United’s buys failed to come off has been disproportionately high by comparison. The continuing absence of a director of football at Old Trafford is surely not entirely unconnected to their deeply underwhelming showing in the transfer market and an issue that needs to be addressed in the summer. As it stands, the impression given is of a club lacking the coherent structure behind the scenes best exemplified by the format rivals Man City have in place, with CEO Ferran Soriano and Director of Football Txiki Begiristain complementing Pep Guardiola in a way that seems unthinkable for contrasting figures to have done in the Jose Mourinho or Louis van Gaal eras at United. The club have now backed Solskjaer for the permanent role, but he is unlikely to thrive without some help. Ahead of what is likely to be a busy summer for United, it seems vital that the club implement a better structure behind the scenes and identify an individual capable of managing their recruitment to prevent them slipping further behind Europe’s elite. Email “Man United paying the price for years of behind-the-scenes ineptitude”. Feedback on “Man United paying the price for years of behind-the-scenes ineptitude”.